Click the All tab on the chat roster to see all your messages, or use the People tab or Groups tab to see individual or group chats. By default, notifications for all chat rooms are on. Use chat preferences to customize how chats display and to set chat notifications. PureCloud automatically shows and sorts chats into five categories: Favorites, Direct Messages, Official Groups, Personal Groups, and Recently Closed. You cannot change the order of the categories, but you can change how PureCloud lists chats within each category. Under Sort Order, you can change the display order for chats in each category. Choose A to Z to list chats in alphabetical order. Choose Most Recent to list chats from newest to oldest activity. At the top of the chat window, click Room settings. 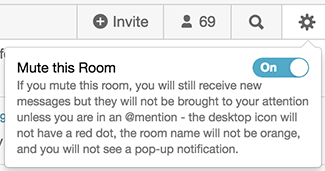 Choose to mute (turn on muting) or enable (turn off muting) notifications from the room. Choose if you receive notifications about new group chat messages. Direct messages and mentions in group chat rooms always create a notification, even if you have hidden all group chat notifications. 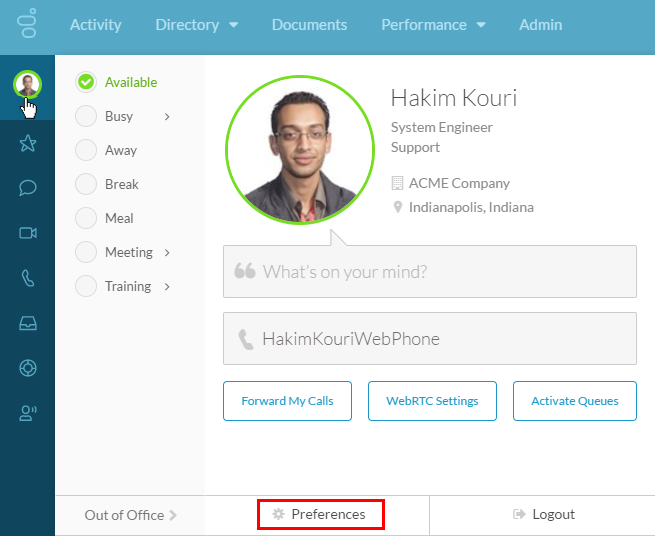 From the sidebar, select your profile picture to access user settings, and then select Preferences. To receive all notifications, select the Show Pop-up Notifications for Group Chats check box. To hide all notifications except direct messages and mentions, clear the Show Pop-up Notifications for Group Chats check box. Note: To see the Show Pop-up Notifications for Group option, first select the Allow Pop-up Notifications check box. If you do not select the Allow Pop-up Notifications check box, then you do not receive group chat notifications. Choose how you want images and other media to appear in all chats. To display images in chats, select Expanded by default. To keep images hidden until you click them, select Collapsed by default. Set the amount of space the chat roster places between the chat room names in the chat roster. For the most spacing, choose Comfortable. For medium spacing, choose Compact. For the least spacing, choose Minimal. You can move people and groups to your Favorites list directly from the chat panel. To favorite a person or group in your current chat list, click the star that appears when you hover over the chat. The chat room name moves to the Favorites category in your chat roster and the star turns yellow when you hover over the chat name. To unfavorite a person or group, click the yellow star that appears next to the chat name in the Favorites category. The chat name moves back to the original category. You can also favorite a person or group from the chat room. Click the star at the top of the chat room. The star turns yellow and the chat room name moves to the Favorites category in your chat roster. Click the star again to unfavorite the room.